"Trail Boss is designed specifically for low velocity lead bullet loads suitable for Cowboy Action shooting. 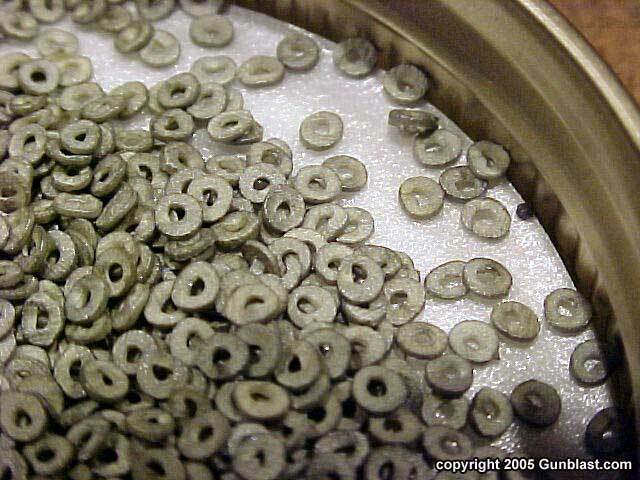 It is primarily a pistol powder, but has some application in rifle. It is based on a whole new technology which allows very high loading density, good flow through powder measures, stability in severe temperature variation and most importantly, additional safety to the handloader." As stated, IMR’s intention was to achieve four things, and I will address them one at a time. 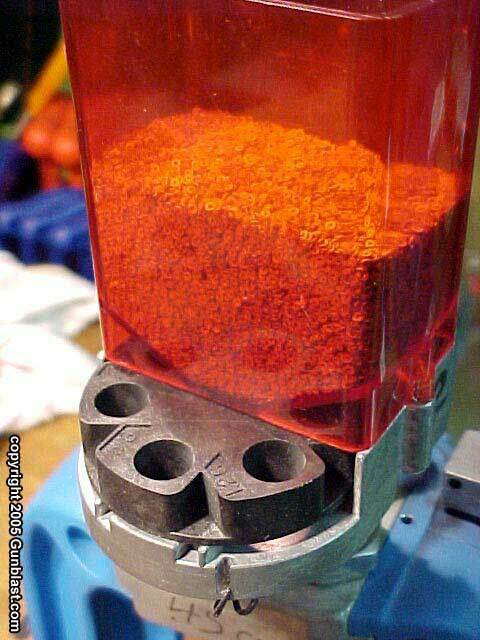 First, the powder was developed to have a high loading density. In other words, to better fill the cartridge case without leaving a lot of room in the case after the bullet is seated. This is important for a couple of reasons. One is that a case that is full of powder usually gives more consistent performance with lower velocity variations and better accuracy. Another reason is that high loading density makes it much easier to spot a case in the loading process that either received no powder charge, or received a double powder charge. Neither condition is desirable. 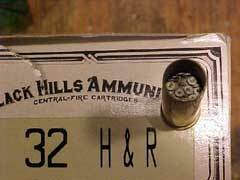 A cartridge with no powder can stick a bullet in the bore, and a cartridge with a double charge can cause the gun to come apart in the shooter’s hand upon firing, sometimes taking valuable parts of that hand along with it. As can be seen in the photos, Trail Boss offers high loading density. 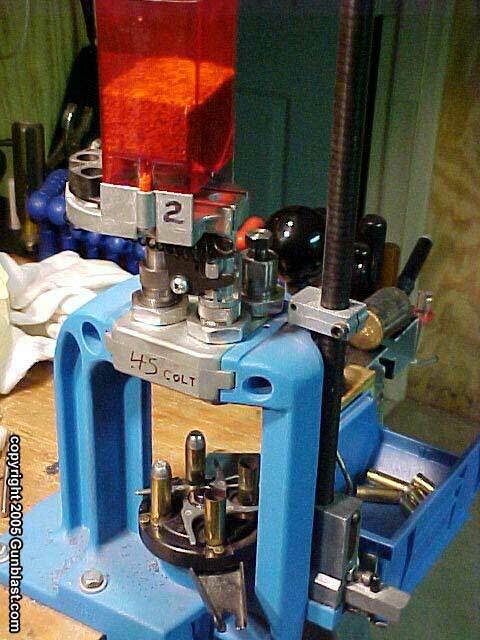 With recommended loads, the case is practically full, leaving just enough room for the bullet to be seated. Trail Boss is a relatively fast pistol powder, comparing closely to Alliant Bullseye, Hodgdon’s Clays and other powders of similar burning rate. However, it is easy to miss a cartridge case in the loading process that has a double charge of some of these other fast powders, such as Bullseye. Trail Boss, on the other hand, will overflow its case if a double charge is mistakenly thrown. The photos show how 6.1 grains of Trail Boss compares to 6.1 grains of Bullseye. Both give close to the same velocities with a 200 grain lead bullet in a .45 Colt, but Trail Boss has optimum loading density for that cartridge case. 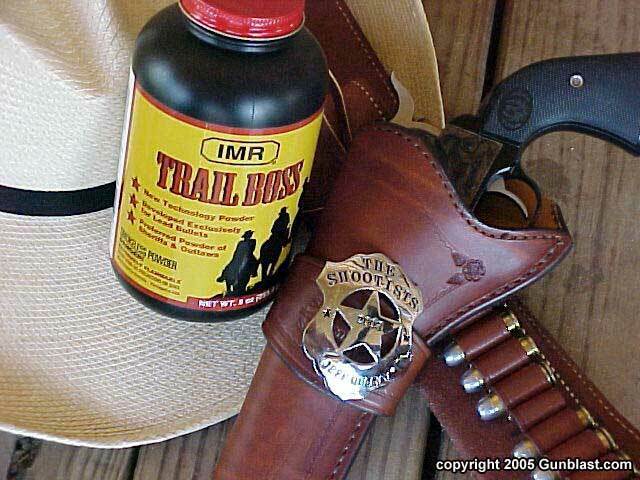 In their effort to achieve better loading density, IMR has excelled with their new Trail Boss powder. Another of IMR’s goals was to achieve better flow characteristics through powder measures. I tried Trail Boss through three different automatic powder measures, and the results were, for lack of a better term, perfect. Trail Boss flows as well or better than any powder that I can think of at this time. The charges thrown were very consistent, with weight variations that were undetectable by my scale, if they existed at all. There was also no tendency to bind in any of the powder measures in which it was tried, of either the slide or rotating drum type. IMR also stated a criteria of stability in extreme temperature variation, of which I made no attempt to perform any test. All of my testing was done under very comfortable conditions of about seventy-five degrees. IMR's last stated goal was that of additional safety for the handloader, which is the most important, and relates directly to their success in achieving higher loading density. 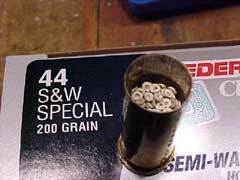 With most all of my hand loading, I try to use a powder which fills the cartridge case, with the exception of relatively low-velocity silent loads in rifle cartridges. 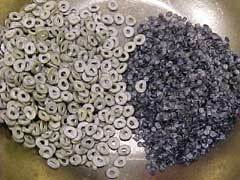 Many shooters like to use a faster powder, and then fill the rest of the case with things like Dacron, cornmeal, Grex, grits, felt, and a number of other things, none of which belongs in a cartridge case. 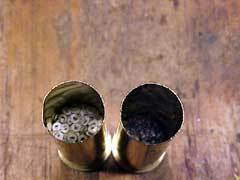 I like to use smokeless powder and nothing else in my handgun cartridges. With high-performance top end hunting loads, this is easily achieved in magnum handgun cartridges using such wonderful powders as Hodgdon’s Lil’Gun and H110, or Winchester’s 296, or a few other relatively slow-burning handgun powders. The problem of double-charged cartridges comes into play with light to moderate loads in handguns that are used for casual plinking, target shooting, or in the sport of Cowboy Action Shooting. Most participants in the fast-growing sport of Cowboy Action Shooting use relatively mild loads in their revolvers and lever action carbines. Trail Boss powder, by virtue of its high loading density, is very suitable to the loads used in that sport. I tested the new Trail Boss powder in several handguns and six different cartridges. The results are listed in the chart below. Velocities are listed in feet-per-second. 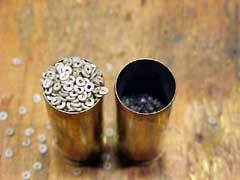 Bullet and powder weights are listed in grains. All six revolvers tested turned in accuracy as good as the weapon has performed in the past, limited by the ability of this shooter. Groups measured at twenty-five yards ran from less than one inch to just over three inches, depending upon the weapon. The Trail Boss powder offered very consistent velocities, and burned clean, leaving little residue and no unburned powder. The fragrance of the burned powder was very pleasant, if that is an important consideration. It is to me. I used Winchester primers throughout the tests, and ignition was perfect with all loads tested. Loading density was ideal in all loads tested, filling the cases, but needing no compression of the charge to seat the bullet. Trail Boss is a single base high-energy powder that is not only suitable for Cowboy Action shooters, but for any handgunner loading standard velocity loads for target shooting, plinking, or small game hunting. Trail Boss is also capable of performing well in moderate velocity loads suitable for hunting medium game such as whitetail deer. However, it is ideally suited for the type of loads used in the sport of Cowboy Action Shooting, and I predict that with these handgunners, Trail Boss will excel to become the preferred powder of that sport. In a field of excellent pistol powders, Trail Boss is that good. It is a powder that is, for lack of a better term, fluffy. It is very bulky for its weight, giving it the desired high loading density. A standard one-pound-sized can holds only nine ounces of Trail Boss. 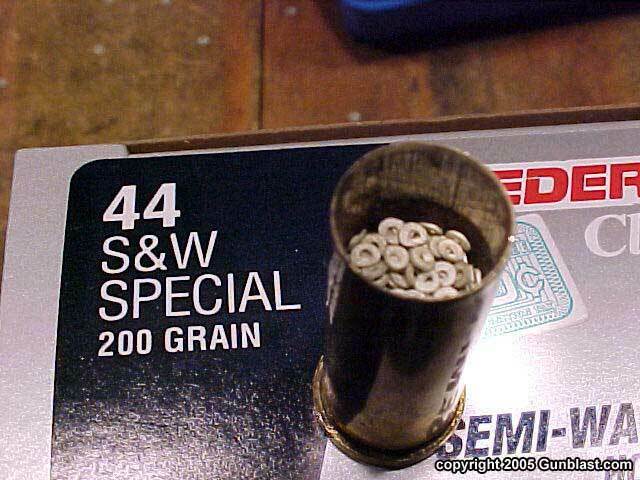 However, its cost per grain is comparable to other powders in its class, and will add nothing to the practical cost of shooting your favorite handguns. Handloaders today have a seemingly endless list of available powders from which to choose. I use many different powders, depending upon the cartridge. 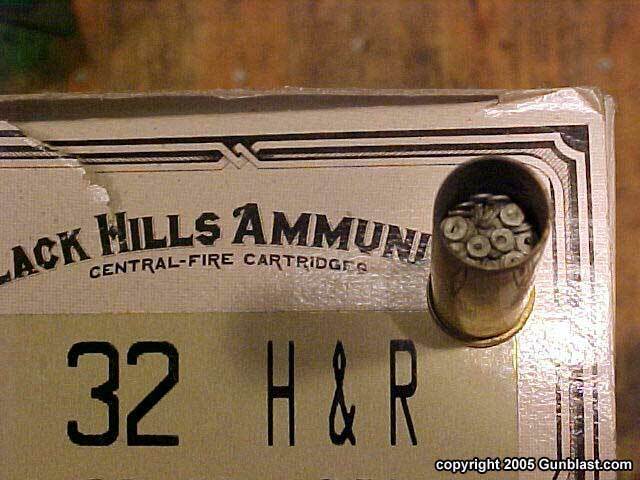 However, I do have some long-time favorites for handgun cartridges, such as WW231, HP38, Universal, Unique, Titegroup, H4227, Lil’Gun, H110, and WW296. I now have a new favorite to add to that list: IMR’s Trail Boss. After using up just one can, I am impressed, and I highly recommend it. For more information on Trail Boss, and for Trail Boss loading data, go to: www.imrpowder.com. 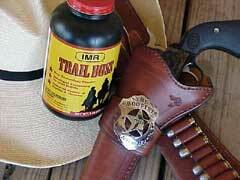 IMR's Trail Boss powder fits in perfectly with other gear for Cowboy Action Shooting. 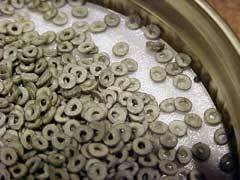 Trail Boss' unique shape and added bulk are apparent when compared to a powder such as Bullseye. 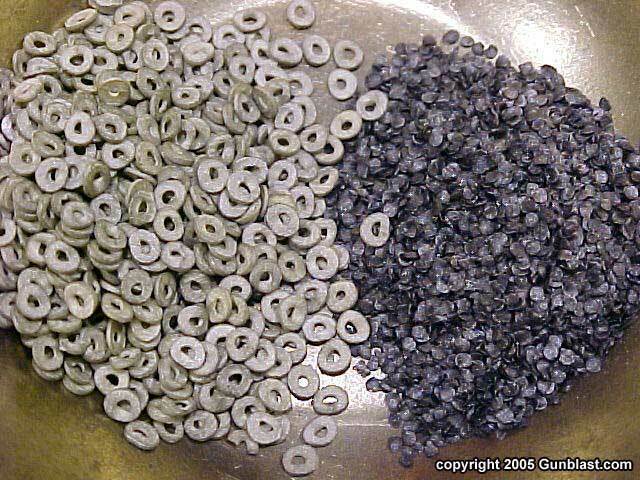 On the left is 6.1 grains of Trail Boss, and on the right is 6.1 grains of Bullseye. 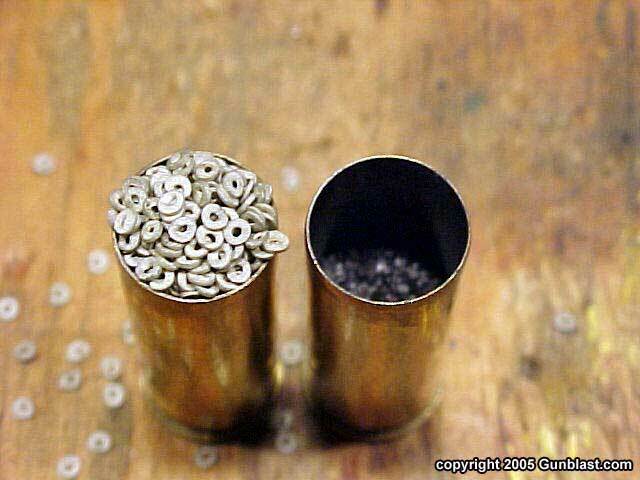 Trail Boss' added bulk adds a margin of safety when reloading. A double charge of Bullseye (right) may go unnoticed, but a double charge of Trail Boss (left) will get your attention! Typical loads of Trail Boss in .32 H&R Magnum and in .44 Special cases show Trail Boss' optimum loading density. Trail Boss' uniquely-shaped flakes meter perfectly through a variety of powder measures without binding. Test loads were assembled using a Dillon 550B progressive press with Lee Auto Disk powder measure.